After 16 weeks of learning Salesforce, web development, and other skills to be successful in a career in tech, the Technology Career Program’s inaugural Cobb class comes to a close with 21 graduates eager to begin their careers in Atlanta’s growing technology and innovation fields. 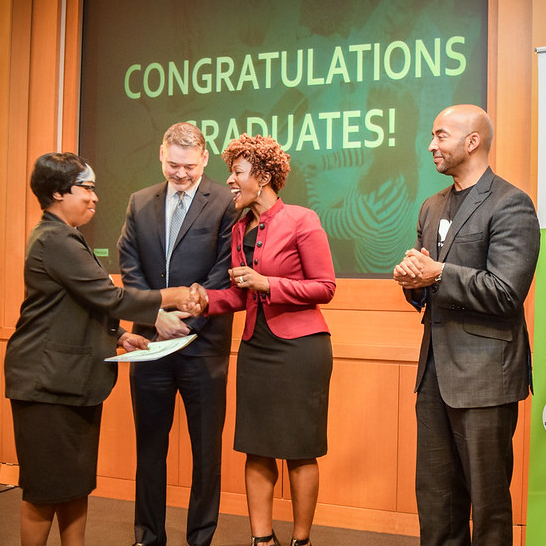 Cobb County’s first class concludes with an 84% graduation rate (vs. 19% college graduation rate in tech nationwide), with 19 of 21 graduates achieving certifications. Notably, 33% of graduates were women and 28% of graduates were veterans. Graduate Kiara Sikes spoke of her experience in trying to make a career change as a veteran and mother of four. Before the Technology Career Program, Kiara was going to school online to pursue an education in a technical field but was urged by her mother-in-law to give the program a try. The Technology Career Program’s evening and weekend hours worked well for Kiara as she and her husband balanced caring for and homeschooling their four children while allowing Kiara to dedicate time to the program. “TechBridge starting this program has opened so many doors to people like me, giving them the change and opportunities to see what technology careers are out there. Having four kids under the age of five was definitely challenging, but they made it possible for me,” she said. Graduate Jamel Jackson also spoke to highlight the program’s impact on his life. “Anybody can start something, but it takes faith and endurance to finish. This program was a place where your character was sharpened and your technical skills were increased on a weekly basis. This inspired me to dream bigger and believe that I can soar higher than before,” he said. The Technology Career Program wouldn’t be possible without the support of our sponsors, partners, and volunteers. Thank you to sponsors Accenture, Baker Hostetler, The Franklin Foundation, Insight, Mailchimp, Salesforce, Southern Company, and Wells Fargo, as well as supporters and partners Atlanta Housing Authority, Atlanta Police Foundation, @Promise Center, Chris 180, Georgia Tech, Goodwill of N.GA, Oakwood Development, Urban League, Woodward Academy, and WrightNow Solutions. The Technology Career Program strives to continue this impact, kicking off their second class in Cobb Feb 19th, 2019. To learn more about the program and see how you can get involved, visit https://techbridge.org/tcp/.